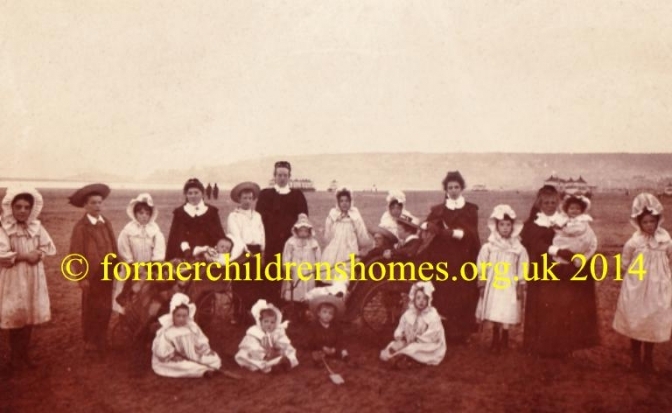 The above photograph is believed to have been taken of the residents and staff of the Weston Super Mare Convalescent Home during a trip to the beach. The home was founded in 1894 by the Royal Hospital for Sick Children and Women. The folliowing 1928 newspaper article (from the Western Daily Press 24th September 1928) talks of an extension that was made to the home to enable it to keep up with demand for places. On Saturday afternoon the recent extensions to the Weston Super Mare Convalescent Home for Children were formally opened by Mrs Richardson, of Bristol, and dedicated by the Right Rev Bishop of Taunton. The Home was started in 1894 by the Committee of the Bristol Royal Hospital for Sick Children and Women, and during intervening years its usefulness has been cumulative, with the result that the buildings have been periodically enlarged. Some time since an appeal was issued for £1,800 in order that the sanitary arrangements might be improved, and further accommodation made for the staff. There was a gratifying response to the appeal, and thus it came about that at Saturday’s function the Home started a new lease of life, with the possibility of even greater service. Mr JJ Jackson-Barstow JP DU presided over the ceremony, and reviewed the history of the institution. From the time of the Home’s inception up to the end of 1927, he said there had been just over 10,000 children admitted, and the results of the treatment they had received had been particularly satisfactory. Out of 10,000 invalids there had been 7,286 cases of complete recovery, 2,142 cases where the patients were certified as much improved, 427 as improved, and only 129 instances where no improvement was shown (Applause). The cost of the buildings and maintenance during all these years had been £96,000. Continuing, the speaker paid tribute to the services of the honorary medical staff, and added that the Home had always been singularly fortunate in having excellent matrons. Mr Cecil Powell (of the House Committee), who was called upon to describe the present alterations and extensions, observed that the isolation Ward had long been a desideratum* while the new accommodation now provided for the staff would enable a larger number of inmates to be taken. The actual cost of the alterations etc had been £1,809, but it had been found necessary to provide some additional equipment, so that the total sum involved was £1,936. The response to the appeal had resulted in £1,012 being secured thus far, which was extremely satisfactory and considerably allayed the committee’s fears that they would have to draw heavily upon their small endowments. (Applause). * Something that is needed or wanted.